Wheaton College’s Dr. E. Beatrice Batson—a matriarch of the faith and Shakespeare too—went to be with the Lord at the age of 98. Dr. E. Beatrice Batson (MA ’47), Professor of English Emerita, died in Batavia, Illinois on Tuesday, January 22. She was 98. Batson was born in Charlotte, Tennessee—and at the age of 12, she told her father she was going to be a college professor when she grew up. To make good on that vow, Batson completed undergraduate work at Bryan College and earned a master’s degree from Wheaton College. 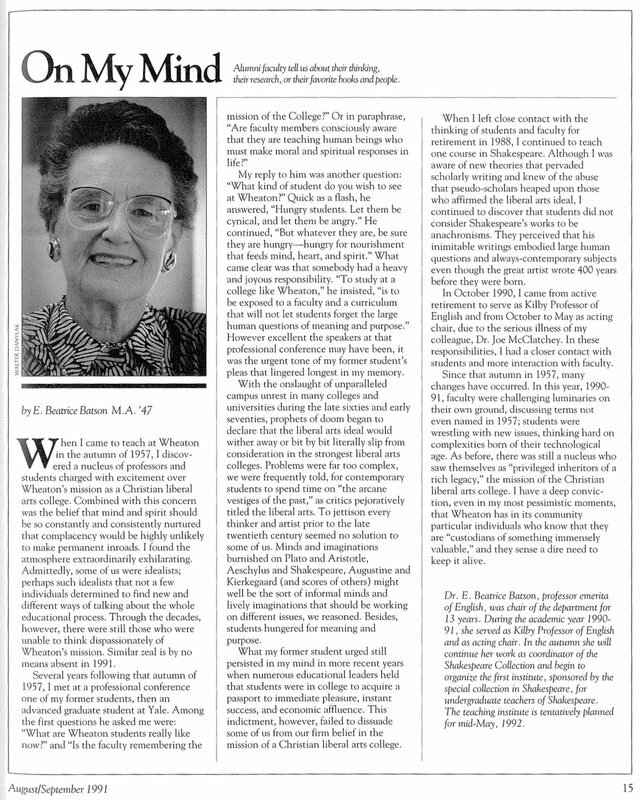 In 1956, she earned a Ph.D. from George Peabody College for Teachers at Vanderbilt University. She completed post-doctoral work at both Northwestern and Oxford universities. In 1957, she joined Wheaton’s English Department faculty, under Chair Dr. Clyde S. Kilby. She spent the next 33 years teaching at Wheaton College—adding to its “extraordinarily exhilarating” atmosphere with her own legendary classes. In 1963 she was presented with the prestigious Senior Teacher of the Year award. “Few of her students will ever forget her passionate readings of King Lear or her rapturous enthusiasm for ‘the journey home’ in Homer’s Odyssey—the voyage that her own noble soul has now taken, in anticipation of the coming resurrection,” said Wheaton College President Dr. Philip Ryken ’88. In 2007, Batson was named Alumna of the Year, not only for her outstanding teaching career but also for her work in spearheading the Shakespeare Collection and Institute at Wheaton College, a collection of the best Christian scholarship on Shakespeare’s works. She also co-founded VII, the Marion E. Wade Center’s annual journal aimed at promoting awareness of its seven authors and encouraging critical assessment of their work. She wrote several books over the course of her life, including A Reader’s Guide to Religious Literature, Word and Rite: The Bible and Ceremony in Selected Shakespearean Works, and Shakespeare’s Christianity: The Protestant and Catholic Poetics of Julius Caesar, Macbeth, and Hamlet. She will be honored at a visitation on January 28, and a funeral on January 29 at the Chapel of the Cheatham County Funeral Home in Ashland City, Tennessee. For more information, visit the funeral home’s website. In lieu of flowers, her family in Tennessee is encouraging her friends and former students to support the Batson Shakespeare Collection and Batson Scholarship Fund.